Does it Matter . . . Closures . . .
As many of you know, I am a huge fan of the screw cap. Let me say at the beginning here that I do NOT believe it is the ‘perfect’ closure as I do NOT believe that there is such a thing. What’s the big deal with TCA? Well, at low levels, it simply steals the aromas from a wine, making it appear that it has none. At higher levels, it makes the wine smell of wet cardboard or of a damp basement.. That said, if you are not familiar with this smell, you probably would not pick it out as a ‘fault’ but instead might find the wine ‘earthy’ instead. And guess what – this happens as soon as the wine comes in contact with the cork at bottling. No, you can’t tell in advance if a cork is infected unless you run costly tests on EACH cork and no, the problem does not ‘appear’ later on years after bottling. The other thing about natural corks – one of it’s most endearing traits, the fact that it is ‘all natural’, is also one of its most challenging.. How can that be? Well, since it’s all natural, no two corks are identical. The individual cells that make up the cork itself are different shapes and sizes, and this allows for slightly different amounts of oxygen to be trapped within the cork prior to bottling and for different amounts to get through the cork during aging. This ultimately leads to ‘bottle variation’ and can, in worst case scenarios, lead to too much oxygen getting in and the wine becoming clearly oxidized. 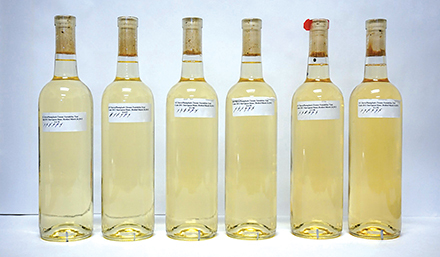 (See the picture above for an example of the same wine bottled under cork and the ‘variability’ that has led to wines of varying color and oxidation levels). Therefore, one of the main reasons I use screwcaps is to ‘eliminate’ these variables. As a ‘manufactured’ product, there is much greater consistency with screw caps, and thus the ‘variability’ that exists with different size cells does not exist here. There also is no chance of TCA being introduced to the wine from the closure itself. (And for those of you who will ‘argue’ that TCA does make it into wines in other ways, you are correct . . . but the VAST majority of TCA issues are cork-related). I have no desire to make ‘sterile’ wines at all. Wines are ‘living creatures’ that will continue to evolve as long as they stay in bottle, and truly ‘blossom’ hours or even days after the bottle is open. But I take offense to the fact that a lot of ‘bottle variation’ that seems to be accepted by consumers is preventable, and as a consumer first and foremost and a winemaker second, I want to be able to stand behind my product and know with a greater degree of certainty that what my customers are consuming is what I desired them to be. I am certainly open to your thoughts on this issue and welcome them.